Washington state's attorney general is going after what he calls illegal payment practices at this ICE detention facility in Tacoma. A privately-run detention center is exploiting immigrants by paying them a dollar a day, Washington State's attorney general says. Attorney General Bob Ferguson said Wednesday that he's suing GEO Group (GEO), a private prison operator. The suit alleges GEO Group uses immigration detainees to run "virtually all non-security functions" at its Northwest Detention Center (NWDC) in Tacoma, Washington -- all while paying them next to nothing. Detainee responsibilities range from cooking and cleaning to painting. "A multi-billion dollar corporation is trying to get away with paying its workers $1 per day," Ferguson said in a statement. "That shouldn't happen in America, and I will not tolerate it happening in Washington." The complaint also alleges GEO Group paid some workers even less by instead compensating them with "snack food such as chicken, potato chips, soda and/or candy." GEO Group said it "strongly refutes" Ferguson's claims, calling them "baseless" and "meritless allegations." "We intend to vigorously defend our company against these claims," the company said in a statement. NWDC is operated by GEO Group via a contract with the federal government. The facility is tasked with holding people that Immigration and Customs Enforcement, or ICE, suspects of being in the country illegally. ICE detainees are kept at such facilities while they await court proceedings. 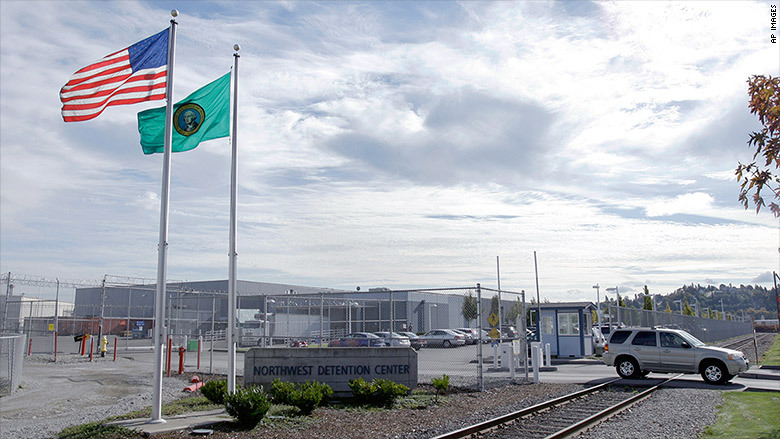 NWDC, which has the ability to hold more than 1,500 people, is the fourth-largest immigration detention center in the country. While government-run prisons and detention centers do not have to abide by Washington's $11-per-hour minimum wage law when paying detainees for their work, the attorney general's office says no such exemption exists for private facilities. GEO Group insists that detained NWDC workers are part of a "volunteer work program," and that the minimum wage "associated with the program is set exclusively by the federal government." Pablo Paez, GEO Group's vice president of corporate relations, said voluntary work programs at "all immigration facilities" abide by rules set by the federal government, including rules "promulgated under the Obama Administration in 2011." According to policy documents on ICE's website, participants in voluntary work programs must be paid "at least" $1 per day. The lawsuit demands GEO Group begin paying Washington detainees in accordance with wage laws, and that it fork over the extra profits it earned by allegedly underpaying workers. NWDC is one of 141 facilities -- including prisons and detention centers -- operated by GEO Group. Private detention centers and correctional facilities are a highly controversial topic. And this isn't the first criticism lobbed at GEO Group. The company "has faced a variety of lawsuits, including a class action suit by current and former detainees at a Colorado facility alleging forced labor," Attorney General Ferguson's press release says. Ferguson's office also said detainees at NWDC have engaged in "multiple hunger strikes" to protest their living conditions. "As many as 750 detainees reportedly participated in one hunger strike earlier this year," the press release states.